High: Leaving Chicago first thing in the morning. Low: 7 hour layover in New York. High: Hugging Alei. Table full of unique (?) 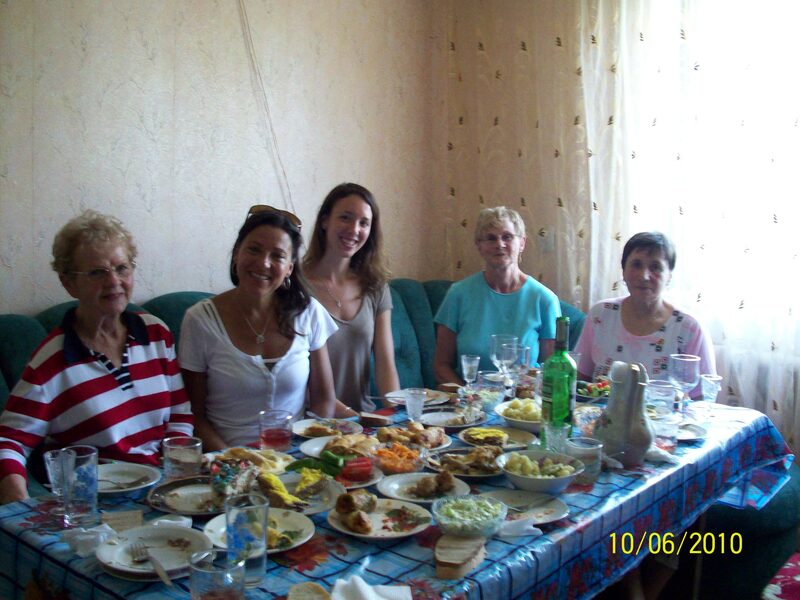 Ukrainian treats prepared by a babusia. 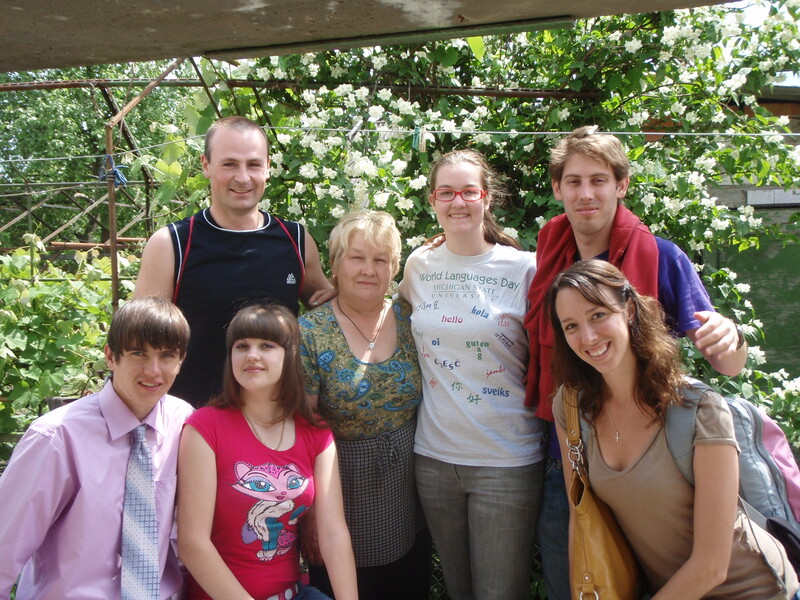 Meeting Alei’s host family. Low: Showering outside with water “warmed” by the sun next to the duck & chickens. Same unique Ukrainian treats at 10am. Real pig heads at the bazaar. Getting myself onto the top bunk of the train in the 95 degree heat & total darkness. High: Waking up in Vapniarka on a train. Deciding to skip the marshrutka (bus) with 75 of my new friends & opting for a private taxi instead. Bazaar in Yampil. Beautiful river Dniester. Old church. Low: Hot. Dusty. Spooky walk to the well (just one man’s opinion). High: Visiting Alei’s school. Seeing some of her students. Getting nails done for $2.50. Building a screen door for Alei to keep out the spiders. Low: It was all good. Dusty, but good. High: Walking to meet Alei’s knitting friends, school friends, & neighbor friends. Taking the bus to the train to Lviv. Seeing the arm shoot out of the dark train car when we opened the wrong berth at midnight (it was late & the language barrier was an issue). Low: Lugging suitcases in the dark to the far platform & almost missing the train when the attendant was reading a paper instead of opening the door for us. 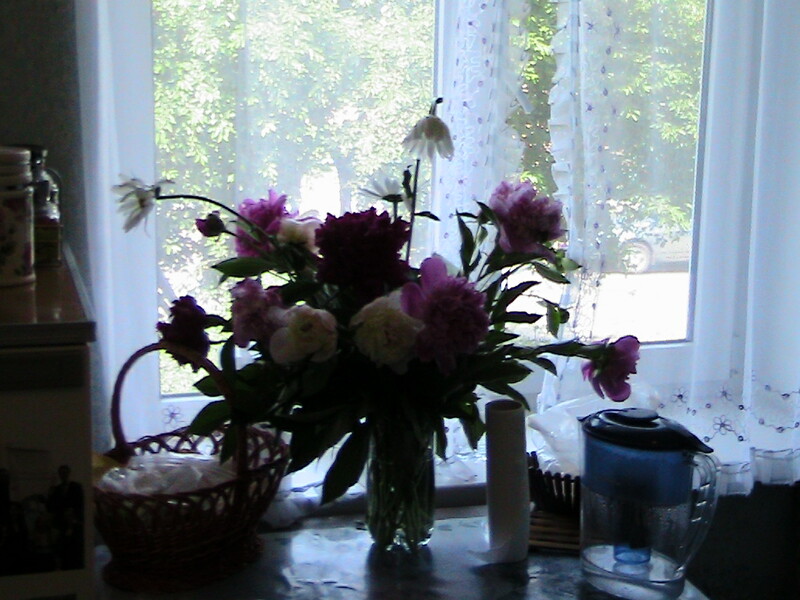 High: Waking up in Lviv. Walking in a postcard down 700 year old cobblestone streets. Bus tour. Finding Gloria Jean’s & her clean/free bathrooms. Low: Getting accosted by crooks on the tram at 7am. 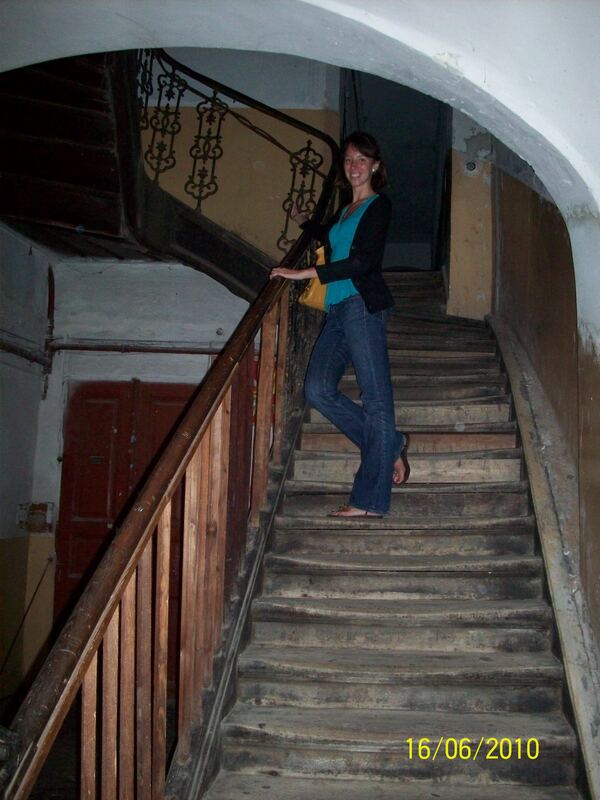 Creeepy entrance to the hostel (700 year old staircase?). High: Did devotionals in an 800 year old church. Coffee on the square. 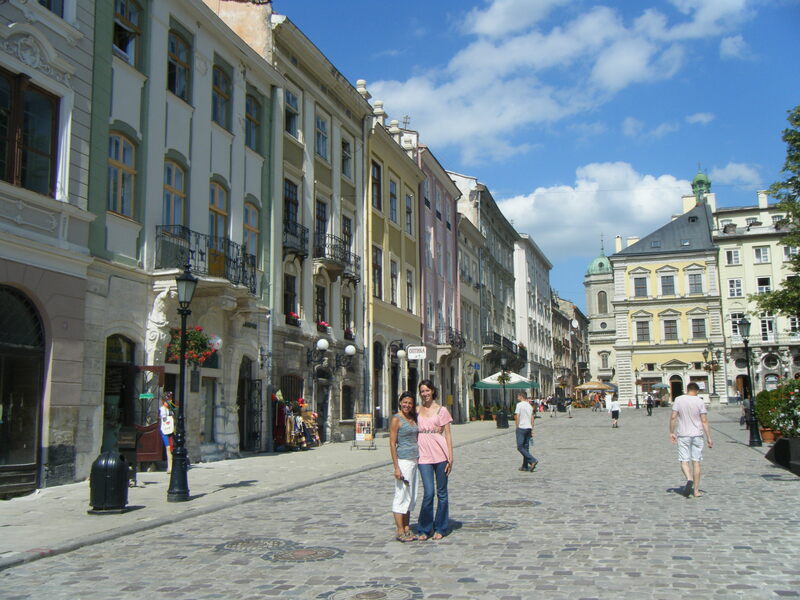 Walking tour of medieval square: churches, parks, & fortified walls of Lviv. 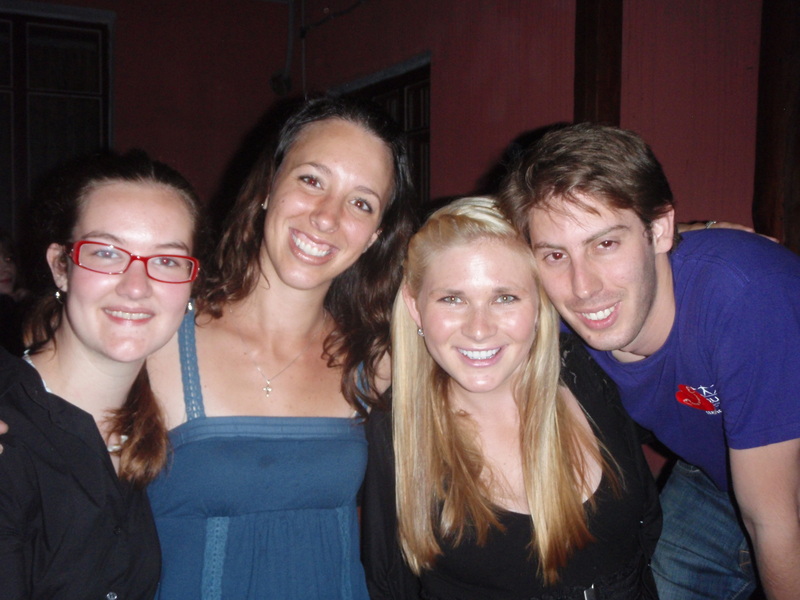 Met up with Emily (Alei’s Peace Corp friend). Saw a ballet. Drank a cup of chocolate. Low: Finding a man in our hostel room. Waking up 400 times a night to the squeaky floor. High: Coffee on the square. Breakfast of gelato & crepes. Climbed to the top of the belltower (didn’t even cry). Drank another cup of chocolate. Saw a church from 1252. Taxied to the airport on time. Landed in Venice at 10:30pm. Found the hostel at 12:00am. Alei let me sleep in her bed. Low: Practically stripping at customs to locate my passport (strategically placed on my person for complete security) much to the amusement of security & the other passengers. Plane was an hour late. No seat assignments, just a stampede of pushy strangers on the tarmac. 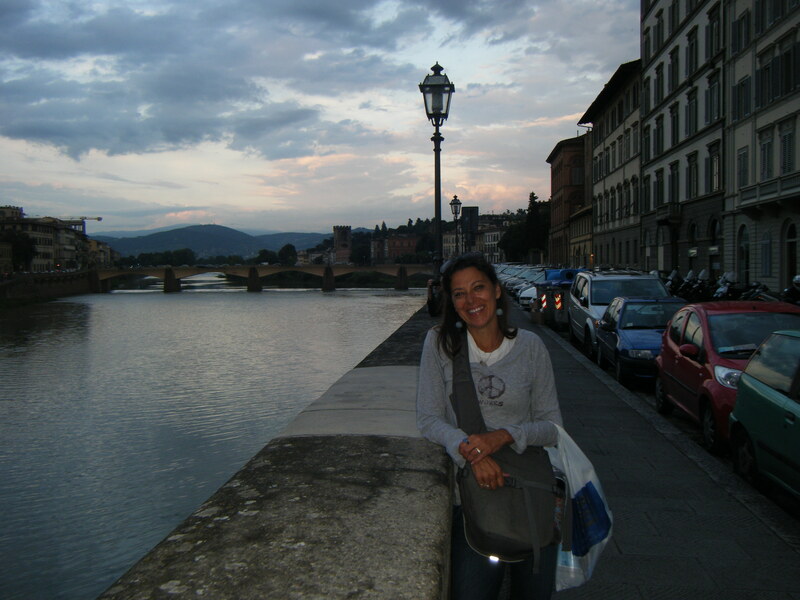 Toting luggage 100+ miles through dark alleys & over 1000 bridges (very slightly exaggerated). Finding a huge bug/creature on the wall of our bedroom. Auntie Jane being overcome by bedbugs & then taking my bed. 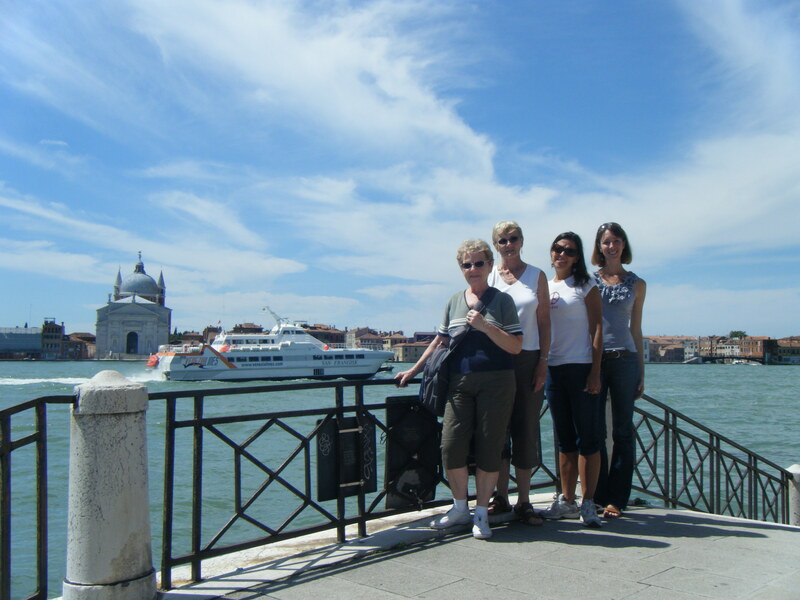 High: Transferred to new hostel sans bugs on the island of Giudecca. New/clean digs. Maw Maw & Jane slept. Alei & I walked over scenic alleys & crossed bridges all day long. Gelato, licorice, risotto, café americcano, Nutella & amaretto biscuits. Got lost in the beauty of a city on water. Also got lost on a mad hunt for more licorice. 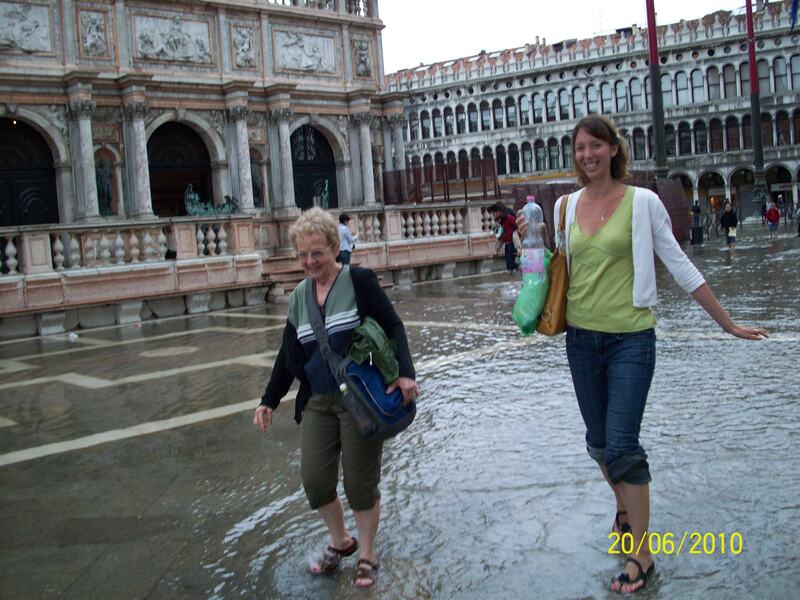 High: Took Jane & Maw Maw to Venice. Toured the Doge Palace. Marched through Saint Mark’s Basilica in 6 inches of puddles. Fed pidgeons. Drank a cup of hot coffee in a cozy restaurant. Early to bed. Low: Rainy & cold. Service fees to eat at a restaurant. High: Hot coffee & chocolate croissants. 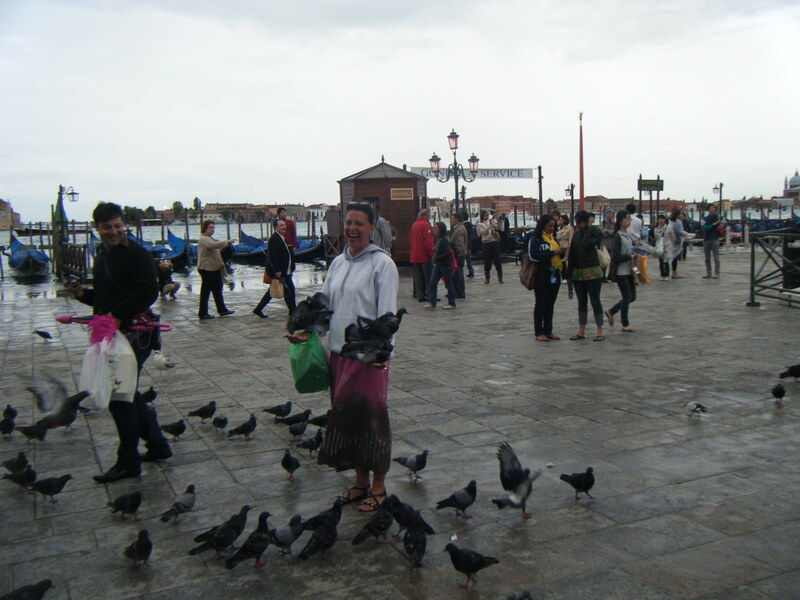 Took a water bus to Murano. Toured glass factories. Shopped. 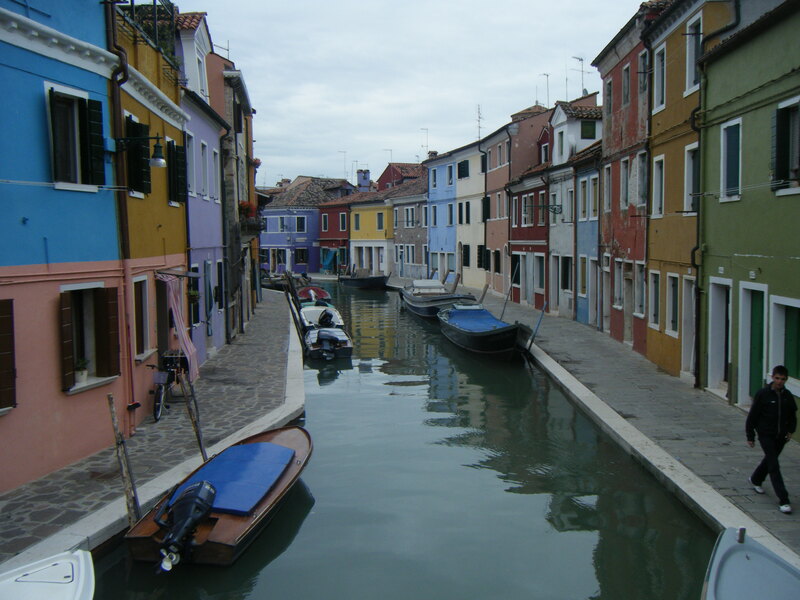 Took a water bus to Burano (another postcard with each home a different color). Snacking our way through town. Seeing lace being made- 7 women x 4 months = $1000 square of lace the size of an endtable (don’t worry Bob, I didn’t buy it). Low: Rainy & cold. Little boat accident, nobody hurt. High: Coffee & croissants (noticing a trend). Water bus through Venice. Sunshine. Didn’t miss the train (barely). Sat & ate cherries, crackers, olives, & stinky cheese- life is good. Train ride through mountains & villages of Italy- breathtaking. 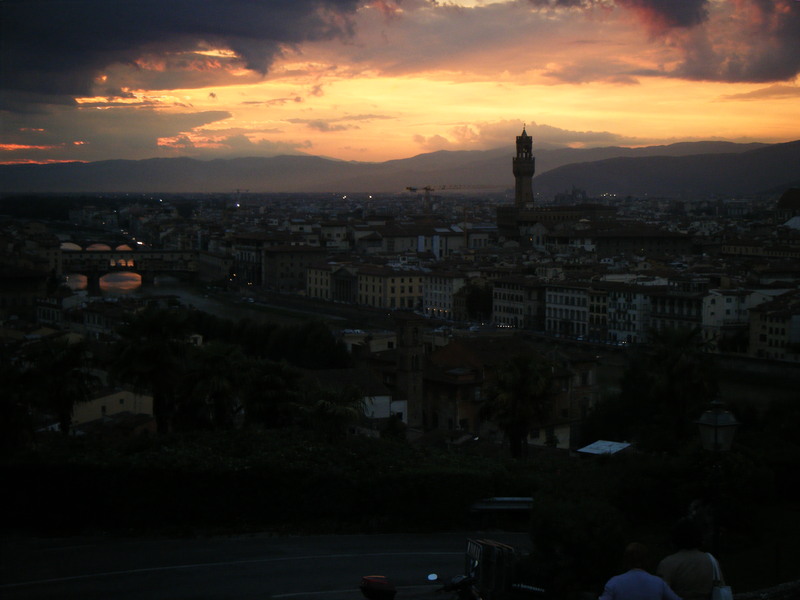 Arriving in Florence. A campsite with a view that redefined beautiful. Wandering along the fortified wall. “Drank our dinner”. Only 2 spiders in our tent. 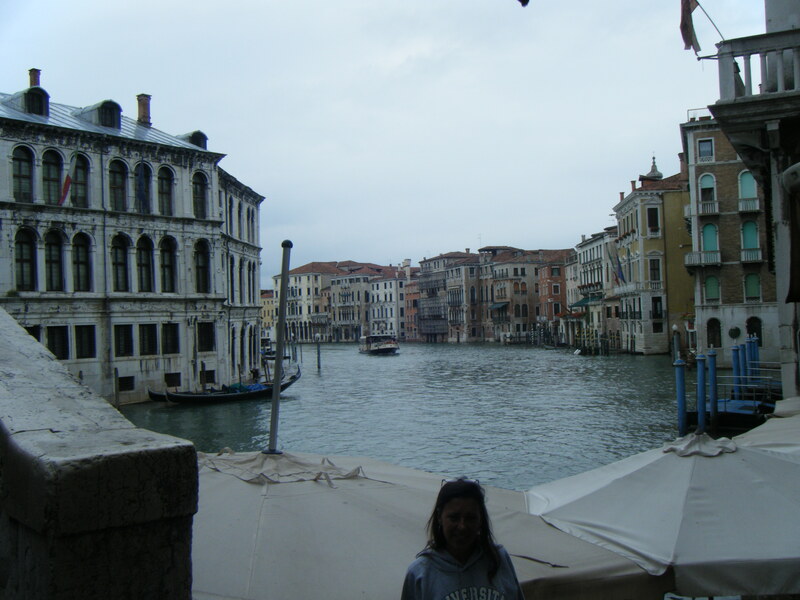 Low: Got off at the wrong stop of the water bus & had to run through Venice with luggage…again. Bus 1.20 Euro. Carsickness & a few years off of our lives- free. Tents are cold at night. 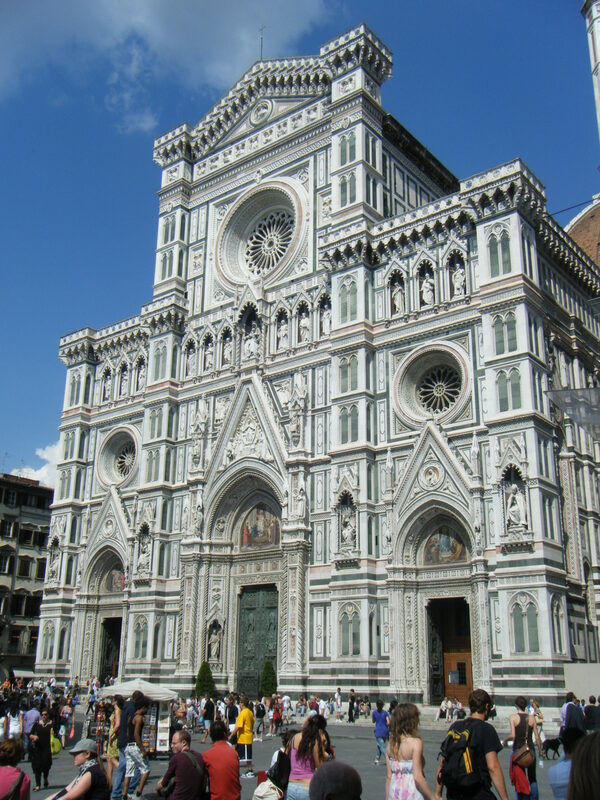 High: Touring San Croce church & seeing the tombs of Galileo & Michelangelo. Alotto gelato. 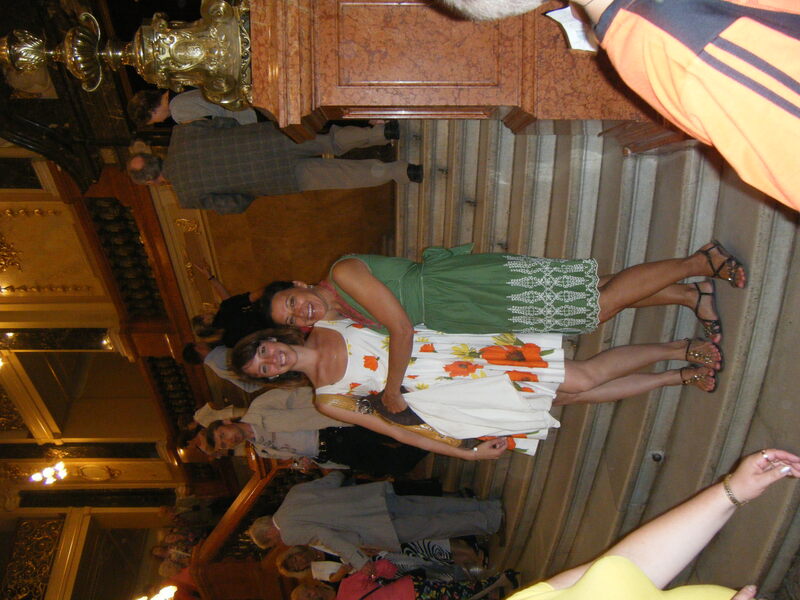 Climbing the steps to the “Gates of Heaven” church & happening upon an Italian play. Sunset overlooking the city with Alei & a bottle of wine. Low: Being left by Aunt Jane & Maw Maw (pretty big city without a phone). Low: Cold shower. A fellow hosteller throwing up wine for a solid 7 minutes on the patio at 7pm (see what happens when you don’t have a drinking age?). High: Coffee & croissants overlooking the city. Relaxing on a train watching the Tuscan countryside roll by. Low: Cranky train seat partners. Overall, the word breathtaking has truly been redefined for us. If you’ve seen it in a book, we’ve seen it in real life. More to come from Rome, Athens, & Corfu. Wish you were here! After a slightly grueling two weeks of mandatory but irritatingly ambiguous & under-regulated testing school is essentially out for summer 🙂 I say essentially because we still have two weeks of ‘practicum’ which from what I can gather is kind of like summer camp where students only have to show up for 3-4 hours & have one class per day or something to that effect but are not tested or graded. Also not all classes have to show up but I’m not sure which ones do/why. It sounds kind of akin to babysitting to me & as you can probably tell I’m still a little bit in the dark about the whole thing, but I do know it starts up tomorrow so I guess I’ll figure it out. This is a pretty good illustration of one sharp edge, my constant need to plan, that’s being chipped or, more appropriately, sledgehammered away by my experience here. Once prone to whipping out my trusty organizer at any crowded party in order to schedule something or the other, I now very seldom know what the next day holds not to mention the next month. Ch-ch-changes. One thing I have not been able to shake however, is my insistence that talking during a test, copying directly from the book, &/or audibly asking a student or (my favorite) the teacher for the answer is not acceptable. Apparently I am alone in this view & spent the bulk of the last few weeks patrolling the classroom & eventually taking off one point (out of 12) for each time I caught someone cheating. A few kids ended up with 2s. At the end an 11th former hoisted a little kindergartner on his shoulders & walked her around the circle while she rang a bell the size of her head, the proverbial Last Bell, symbolizing the end of the year. It was quite cute & was followed by a class picture with my 10th formers (seen above. You’ll recognize me as the only one smiling like a dope) & gifts of enough beautiful peonies (my fave) to liven my apartment with two gigantic bouquets. Later that night I was all packed & ready to celebrate the weekend away complete with blow-dried hair (such a rarity nowadays). After a day full of sunshine galore I got to the end of the street & just like in the movies, instantly a dark cloud appeared with a pretty intense thunderstorm in tow. Unprepared for the onslaught, I was forced to run down the main street in town to the bus station like an idiot trying to avoid landing in one of our many potholes while holding on to the straps of my backpack to keep it from constantly thumping my back & knocking the wind out of me. I failed colossally on all attempts but was actually enjoying the puddle-jumping & beautiful lightning & then caught my reflection in a shop window & started laughing my head off. I shudder to think of what the given 50 people who witnessed the fiasco must think but luckily I did make it to the bus on time. I’m pretty sure I looked like Maddie after she plays with the hose for 20 minutes & listening to the centimeter of water squish loudly while I trudged down the aisle of the crowded bus felt a whole lot like a walk of shame but miraculously the woman unlucky enough to have the seat next to me didn’t scowl or even tell me that I was sure to get sick & die. Four hours later I was on my way to drying off thanks to my bed on the warm train en route to Kyiv. After a surprisingly comfortable snooze I awoke in one of my favorite places, the main train station, made a brief but essential stop for some McDonald’s coffee to go, & was on my way to Morozivka to celebrate Yanna’s graduation. I’d been alerted about the grand event early in January & thus discussed well in advance some important details including what to wear. I was assured that while the people in the ceremony would dress up, everyone else would just wear normal clothes & thus I showed up in jeans & a sweater. Big mistake. Everyone in the ceremony wore suits & prom dresses & everyone else was dressed like they were going to a wedding complete with manicures & fancy hairdos. 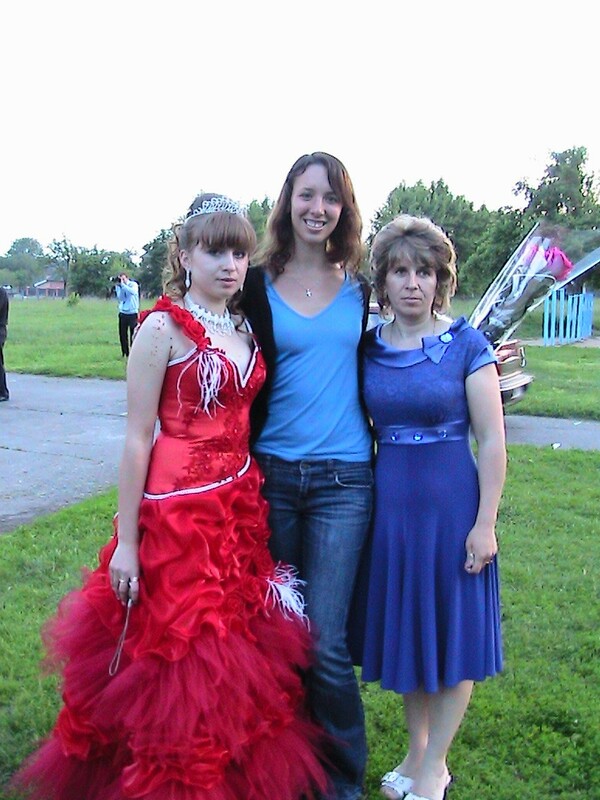 Yanna got to design a dress & have it made by a seamstress in a near(ish) city which sounded a little over the top until I remembered my homemade perfect, princess, hot pink prom dress & the patient & creative Mom who made it all possible. Her dress was equally extravagant & between the gown, bling & tiara she definitely looked like royalty. Her classmates followed suit. I think I’ve mentioned that less is never more in these parts & almost every dress had a hoop skirt, corset back, & beading & bedazzling as far as the eye could see. As the designated documenter I took a video of the graduates in action listening to the National Anthem. See if you can guess which one represents the mullet of all prom dresses. The ceremony was very sweet & included individual speeches about each student since their class was so small. They would be announced & escorted down the aisle, & then they would get to listen to a long list of their many winning traits & achievements while their family members & friends lined up to give them armfuls of beautiful bouquets. It seemed like such a cool moment & the community outpour was so great that by the time all was said & done they’d have flowers stacked knee high in every direction. And then it would go to the next person. This was no quick process but I was enjoying the translating challenge when I noticed Yanna talking to the director (like a principal) & then walking across the stage headed straight towards me. My first thought was that I was going to be asked to leave on account of my casual digs but even more mortifyingly she relayed the message that I needed to give a speech. To practically the whole town of Morozivka. In Ukrainian. Now. Try as I might, there was no time for a panic attack as I walked up to the stage silently reassuring myself that I’ve already made a fool of myself on many an occasion. Is ‘reassuring’ the word I was looking for? After being escorted to the main stage with all of the other teachers I actually had a few minute to think about what I was going to say in Ukrainian w/ an attempt at proper grammar & was able to congratulate them & assure them of their bright futures before the English teacher came to the rescue & translated the rest of my speech. It wasn’t a nightmare, but after sitting on display in front of all 300 people (not to mention crying when they did the cute parent/student parts of the ceremony) I really, really wish I hadn’t gotten stuck in the rain & worn jeans. I could have at least put on makeup. 2 hours later the graduates headed off to a disco where they danced until sunrise (literally) & I went back with the extended family to do a little celebrating of our own. I really do feel like part of the family now & have even succumbed to the cheek kissing habit as a standard greeting/farewell. After another nice night of sleep in what feels like ‘my’ bed I was back to Kyiv to start on the second leg of the journey: a five hour train ride to Derojhennya for Ashley’s birthday. 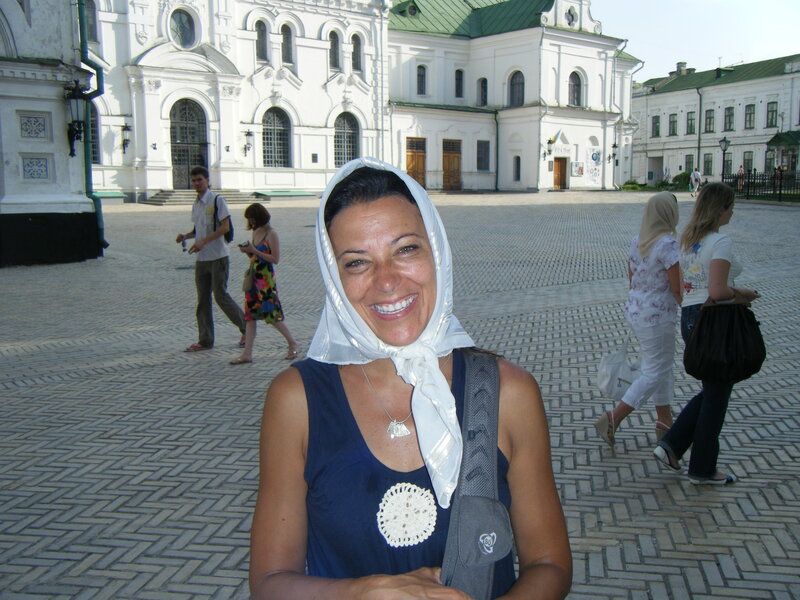 She lives in a house with an older woman, Totya Anya, who recently became widowed. It’s worked out quite nicely for them both as neither are lonely & Ashley’s been able to practice her Ukrainian, wash her laundry in a machine (quite a luxury), eat fresh produce from the huge garden & play with the puppy, kittens, & baby ducks that share her backyard. Totya Anya is completely adorable, the kind of lady who holds your shoulders when talking to you, & insisted on throwing a birthday party for Ashley & inviting her crazy American friends- Emily, our friend Nick from a nearby town, & I. Ukrainians were also fairly represented as Ashley’s counterpart is 23 & joined in on the festivities & Nick brought a 27 year old native that attends his English clubs. This made for some funny conversation as we could try to speak Ukrainian with someone to translate our horrendous mistakes. Equally humorous was having each other to laugh with when things got lost in translation as evidenced when Ruslan (the Ukrainian) asked Emily if it was normal for him to call her Emil for short (pronounced exactly like Emily but without the ‘ee’) which eventually progressed to Terrible Emil. Something tells me that’s a nickname that’s going to stick. There was a lot of food but shockingly not a lot of pressure so we feasted leisurely before squeezing 7 people in a taxi to the outdoor disco. I’m not sure that the establishment was ready for the scene we caused when Nirvana played randomly but it was definitely a good time. I didn’t acquire a sweet new nickname but I did get a marriage proposal. Judging by the fact that I still hadn’t made any attempt at cleaning up after the torrential downpour I’m guessing that he was motivated to score a green card more than a spazzy dancing, illiterate, disheveled American wife so I had to decline. The next morning we got to sleep in & then Ashley showed us all up by whipping up french toast with an orange-honey glaze. We savored the good breakfast & even better conversation & then walked to the train station where by some fluke our trains were all scheduled within 30 minutes of each other. And finally on a ‘layover’ between the train & bus that take me back to Yampil I made friends with a babusia & (I think) a train conductor, was able to talk to them about Peace Corps & then was presented with another ice cream cone. It was a very nice gesture, but I’m starting to get a bit of a complex from everyone getting me ice cream without my asking. Is it that obvious? Do I look perpetually in need of comfort food or do people see the double chin & just assume? Intrigue. Oh well, overall it was a wonderful & much-needed weekend. Now all that’s left is a few days of this elusive camp, another weekend away with different volunteers in my area, & then…drumroll please…MY VISITORS!!! I’ve been exercising my right to organize by poring over possible itineraries/flights/hotels/hostels, ect. 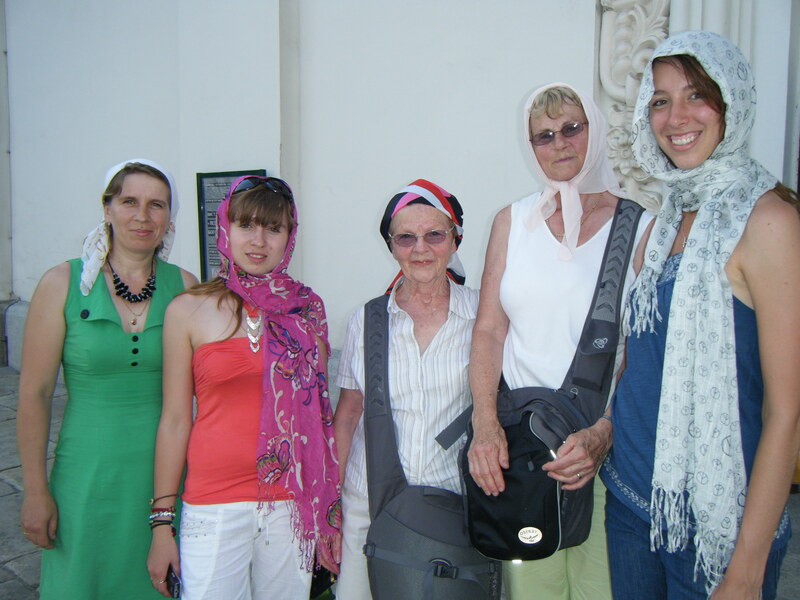 for the past few weeks & am pleased to say that our official schedule includes Kyiv & Morozivka w/ the host fam for 2 days, my town for 3, a day in Lviv before flying abroad where we’ll have 3 days in Venice, 3 in Florence, 2 Rome, 2 in Athens & finally 3 on a beach in Corfu, Greece before heading back to Kyiv (Maya, let me know if you can join @ any point please :)). It’s beyond surreal at this point & such a once-in-a-lifetime kind of thing to do with my mom, grandma, & great-Aunt that it really makes a 2 year commitment seem pretty OK in the long run. I guess that’s all I’ve got. Happy Memorial Day & congratulations Jeff & Dale LaBelle!